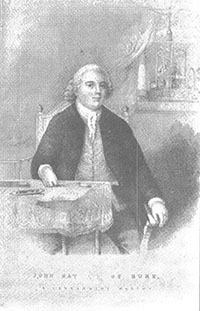 His invention of the ‘Fly Shuttle’ or ‘Flying Shuttle’ made John Kay one of the founders of the Industrial Revolution, and put him in the history books alongside names such as Arkwright and Crompton. Originally called the ‘Wheel Shuttle’ in England, it was the name ‘Navette Volante’ used during John’s time in France that came back to this country as the ‘Fly Shuttle’ [WM]. The first attempt at a formal account of John’s life and origins that used primary source material was made by John Lord in his ‘Memoir of John Kay: Inventor of the Fly-Shuttle’ (published in 1908). The picture reproduced here is taken from that work, though there can be no guarantee of its authenticity. John Lord admitted as much; he had four possible pictures, and felt that this one displayed the gravitas befitting his subject (see note). 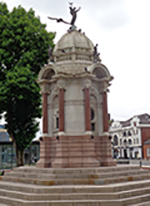 Other pictures on this page are of the John Kay memorial in Bury. The definitive work on John’s life can be found in the two chapters on John Kay by Julia Mann in ‘The Cotton Trade and Industrial Lancashire’ (1931). If you are looking for a summary of that or for more information, the article in the Dictionary of National Biography (2004 Edition) is excellent; nearly all UK public libraries offer free on-line access. Our intention is to research his antecedents and descendants, but we do need to give a brief synopsis of his life here to put that research in context. The account given here is derived from the work of John Lord and Julia Mann, and from notes compiled by Rita Hirst based on a lecture she gave on John Kay in 1983. Rita has been an invaluable source of help and advice to many Kay researchers over the years; she says she has sworn off Kays now, but even in retirement she continues to guide us. So what do we know about John Kay? John Lord made the assertion that he was born on 16th July 1704, the fifth and posthumous son of Robert Kay of Park; there is certainly an entry in the registers of St. Mary in Bury for that birth (see note), but he did not offer any proof that this was the same John. His information came from the writings of Canon Raines, who himself had the information in about 1850 from a Miss Whitehead, a descendant of John’s oldest son Robert. This origin is now generally accepted, though it has to be admitted that we are still looking for the definitive proof; theories of links with Colchester or Woodsome in Yorkshire stem originally from the writings of Lt Col Thomas Sutcliffe in the 1840s which were totally demolished by John Lord and are to be ignored (see note). Born three months after his father’s death, he was left in the guardianship of his mother Ellin and her brother William Entwistle of Edgeworth. Ellin was remarried in 1709 to John Hamer, a stonemason, who died in 1716 [RH]. The young John was apprenticed at the age of fourteen to a reedmaker in Bury. The story, derived from Miss Whitehead, that he returned home a month later saying he had learnt all he needed to know may or may not be true; if it is, we can be sure he was packed straight back again [RH]. He married Ann Holt on 29th June 1725, and in March of the next year, the young couple moved to Bury where he set up trade as a reedmaker; the settlement certificate for that move dated 17th March 1725/6 still exists [BCL*]. It was as a reedmaker that John first made his mark; reeds were the vertical frames that formed part of the loom, with thin strips of reed or cane to separate the strands of the warp, and to compress the weft as it was threaded through the warp. The first product of John’s fertile brain was a metal reed, where wire replaced the cane. This development was an instant success, and the next few years were spent travelling the country selling his metal reeds [JL]. In 1730, he lodged his first patent for an ‘Engine for Twisting and Cording Mohair and Worsted, &c.’, and then in 1733 came his most noted contribution, a ‘Machine for Opening and Dressing Wool; and newly invented Shuttle, &c.’ [BL*]. 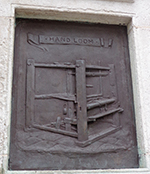 In the process of weaving, the shuttle is the spool on which the yarn that forms the weft is carried as it is passed to and fro through the warp. Previously, it had to be passed by hand, a laborious process; if the weaver was to do it himself, there was a severe limitation on the width of the cloth that could be produced; to produce a broader cloth, two assistants were needed. John’s ‘newly invented’ shuttle ran on wheels across a board, allowing the weaver to operate it simply by pulling a cord. In 1733, John went into business in Colchester with a ‘bay’ maker named Solomon Smith, joined later by a London merchant called Henry Abbott; Colchester was one of the principle centres for manufacture of bays, which were largely made on broad looms [WM]. 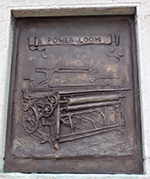 But the new machine was not perfect; a demonstration in Bury later that year left the weavers unimpressed, saying it did not work, and two years work were needed to produce a better model. As part of the process, he made the shuttle longer and heavier and fixed the spool at one end to reduce the risk of the yarn breaking. The introduction of the wheel shuttle into the woollen trade was slow, not reaching some areas for another 60 years, though it was faster in the newly developing cotton industry [WM]. But the new method of winding the shuttle – the ‘bobbin shuttle’ as it was known in Lancashire – was an instant success. And this is when John’s problems began. There were constant infringements of patent for the wheel shuttle – the Colchester partners brought several actions between 1737 and 1743, none of which seem to have been successful – but the real issue was with the bobbin shuttle. Weavers adopted it enthusiastically and claimed, probably correctly, that as it was a later improvement it was not covered by the original patent. They formed themselves into ‘Shuttle Clubs’ to fight the actions John was bringing against them and invariably won [WM]. 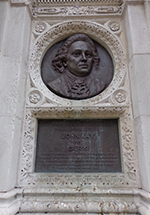 John lodged two more patents – in 1738 for an ‘Engine for Raising Water, &c’ and in 1745 for a ‘Loom for Weaving Tape, &c, Kiln for Drying Malt; Apparatus for Economising Fuel in the Manufacture of Salt’ [BL*]; this last included the means for harnessing water power to drive Dutch Looms and was taken out with a Joseph Stell of Keighley, for whom it was devised [WM]. His fertile brain was still active, but the constant litigation had reduced him to penury and in 1747 he left for France to try for better fortune there. Stories about the mob invading his home and driving him out of the country, as immortalised in the painting by Ford Maddox Brown, seem to have been a later Victorian invention; there was mob unrest against him, but this took the form of attacks on works using his new shuttle, and as reported by his sons Robert and John, took place in earlier years [WM]. In France, John went to Abbeville to the Dutch firm of Scalonge where he started negotiations with the French government. It was there that he learnt of the death of his wife Ann in childbirth [RH]. What followed has the ingredients of a farce or a Greek tragedy. The French government were enthusiastic about the wheel shuttle and the bobbin shuttle, and John agreed to go to Mony in Normandy to conduct experiments on both. But over the following years there were continual quarrels; John was demanding preposterous sums of money, and at one point threatened to take his work to Spain. A settlement was finally reached in 1749, and John agreed to bring his sons over from England to help him. All seems quiet for a while with his invention being taken up in a number of provinces [WM], and he had three of his sons – Robert (aged 24), James (aged 14) and John (aged 12) – with him in Paris by 1752 [RH]. While his sons managed the workshop, John concentrated on making an improved card-making machine, a task that was to occupy the rest of his life. Carding is part of the process of stretching and straightening raw wool before it is spun into yarn, and John hoped to improve the quality of French yarn which was deemed to be inferior – see our page on carding for more about this. By 1754 he had produced two machines, one to pierce holes in the leather of the card and the other to cut and sharpen the wires. But he again quarrelled with the government over the money he wanted for them, and he is reported to have smashed his machines at the end of 1755. He then managed to quarrel with his sons whom he accused of conspiring behind his back to obtain money! He returned to England in 1757 but was back in France in 1758 at which point the government threatened to stop his pension to try and make him see reason. This sent him straight back to England again ‘for good’ [WM]. It is believed that in all John returned to England five times. But some of those visits were during the Seven Years War between Britain and France, and he was regarded with acute suspicion by his countrymen who saw him as working with the enemy [RH]. He visited in 1765-6 when he exhibited his carding machines to the Society of Arts, and was back again in 1773, but that seems to have been for the last time. His old contacts in the French government had gone and his earlier work forgotten, and his last few years were spent in Sens working with an Englishman called Hall; the last known letter from him was from there in 1779. The pension was no longer forthcoming and he is believed to have died there, once more in penury, in the winter of 1780-1 [WM]. That, in essence, is the story of a man whose inventiveness was great, but whose business acumen was not. It has to be said that while he cannot be blamed for his treatment in England, his problems in France, where he was given so much encouragement, were largely self-inflicted. Julia Mann described him as ‘vain, obstinate and suspicious’ while the French government said of him “he possessed the inconvenient quality of being difficult to manage” [WM]. But we return to the main focus of this project: for details of his ancestry (click here) and his descendants (click here).